From the time of our earliest childhood encounters with animals, we casually ascribe familiar emotions to them. But scientists have long cautioned against such anthropomorphizing, arguing that it limits our ability to truly comprehend the lives of other creatures. Recently, however, things have begun to shift in the other direction, and anthropologist Barbara J. King is at the forefront of that movement, arguing strenuously that we can—and should—attend to animal emotions. With How Animals Grieve, she draws our attention to the specific case of grief, and relates story after story—from fieldsites, farms, homes, and more—of animals mourning lost companions, mates, or friends. King tells of elephants surrounding their matriarch as she weakens and dies, and, in the following days, attending to her corpse as if holding a vigil. A housecat loses her sister, from whom she’s never before been parted, and spends weeks pacing the apartment, wailing plaintively. A baboon loses her daughter to a predator and sinks into grief. In each case, King uses her anthropological training to interpret and try to explain what we see—to help us understand this animal grief properly, as something neither the same as nor wholly different from the human experience of loss. The resulting book is both daring and down-to-earth, strikingly ambitious even as it’s careful to acknowledge the limits of our understanding. Through the moving stories she chronicles and analyzes so beautifully, King brings us closer to the animals with whom we share a planet, and helps us see our own experiences, attachments, and emotions as part of a larger web of life, death, love, and loss. "A beautifully written book that will appeal to animal lovers." "I must admit that I was skeptical that an entire book could be written on the subject of animal grief, because the scientific literature in this area is so painfully thin. But Barbara King has succeeded beautifully. She has collected an incredible database of stories about various kinds of animals, and taken together they offer more than enough substance to sustain this book. It is as if she has created a mosaic for her reader. She has collected bits and pieces--individual stories about one animal or another--which by themselves might be little but trifles. But King pastes them together with masterful skill, and the result is a compelling picture of animal grief. We get the feeling that there are still a lot of blank spaces on the canvas, as our scientific understanding is far from complete, but it is only a matter of time before these spaces will begin to fill in. How Animals Grieve is a fascinating book which will interest and inform animal lovers and scientists alike." 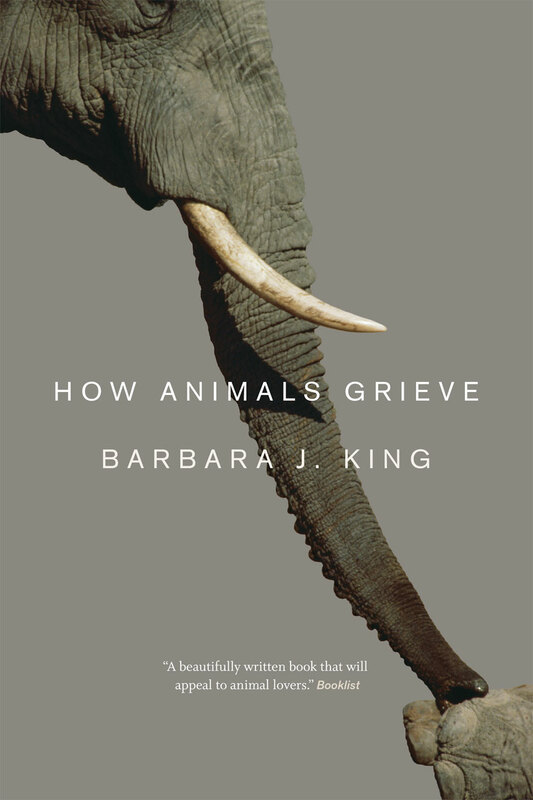 "In this deeply moving and beautifully composed treatise that is sure to anger some, but inspire many, Barbara King methodically presents her powerful evidence that many animals possess thoughts, feelings and emotions, including the profound sense of loss following the death of a family member or close companion. Consider, for example, the female dolphin who carries her dead calf for several days, loath to part with her beloved child. What else is she doing but grieving? It might be a controversial, minority viewpoint that some animals mourn the death of others, but King’s profound and well-documented work has left me firmly in her camp." "Humans and other animals experience love and fear, and form deep emotional bonds with cherished companions. We mourn when a close friend dies, and so do other animals, as Barbara King’s poignant book illustrates in compelling detail. How Animals Grieve helps us to connect and to better understand the complex social lives of other animals and of ourselves." "Let me begin by saying I recommend this book to anyone who doubts that animals grieve. The evidence presented is overwhelming." "How Animals Grieve is not the definitive work on animal grief, but rather a stepping-stone to further investigation, observation and understanding. King hopes others will continue to look with fresh eyes, expand our knowledge and better understand all animals." "Admirably, carefully, and cautiously reviews and synthesizes a topic that is of great interest to numerous people, including those who are fortunate enough to live with nonhuman companions, those who are lucky enough to study them, and those who are interested in other animals for a wide variety of reasons." "King’s thoughtful, warm-hearted prose will raise awareness and amaze readers." "King makes a compelling case for the rich and deep emotional lives of other animals."